For IGNOU July 2018 session, candidates can apply till August 31, 2018. 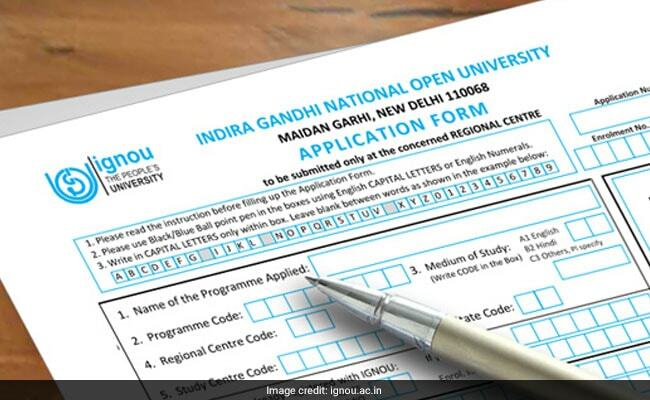 For admission to various postgraduate/ graduate/ diploma courses in July 2018 session, Indira Gandhi National Open University (IGNOU) has extended the last date for application submission. 'The Indira Gandhi National Open University (IGNOU) has extended the last date of submission of Online and Offline Fresh admission of all Masters/ Bachelor/ Diplomas programmes up to 31st August, 2018 for the July-2018 session,' reads the official statement from the University. This is the third time, the varsity has extended the application submission deadline. First time applicants are advised to click the available programme tab on the homepage of the Online Admission System and select the desired programme and carefully read the details of programme including eligibility criteria, fee details, duration, etc. According to a statement from IGNOU, the scheme of fee exemption to the SC/ST students would also be effective in July, 2018 admission cycle for all academic programmes. IGNOU has said earlier in a press release the first time applicants of the programmes may click on the available programme tab on the homepage of the Online Admission System of IGNOU and select the desired programme and carefully read the details of programme including eligibility criteria, fee details, duration, etc. Applicants can also download the complete details of the programmes from the IGNOU website. Details of various IGNOU academic programmes for the July, 2018 session can be accessed from the link http://onlineadmission.ignou.ac.in/admission/.